NYMMS is a monitoring system written in python that takes influences from many of the existing monitoring systems. It aims to be easy to scale and extend. NYMMS intends to scale as easily as possible. It does so by separating out the work often handled in a monitoring system into multiple processes, and then handling communication between those processes with queues. None of this is revolutionary (Shinken broke the Nagios daemon up into many small pieces, and Sensu made heavy use of queues, and all of them are excellent monitoring systems that we take heavy influence from)- but I’m hoping to bring the two together in useful ways. The daemon responsible for reading in the configuration, figuring out what it is you want to monitor and how you want to monitor those things, and then submitting tasks to the queue for probes. The daemon(s) responsible for reading from the task queue and taking those monitoring tasks and executing them. It sends along the results of those monitors to the results topic. The daemon(s) that takes all the results, applies filters to them and then passes off the results that pass the filters onto their various handlers. Handler’s can do just about anything with the results, from emailing people to triggering an incident in PagerDuty, to submitting stats to a stats system. Finally the reactor updates the state database with the result. 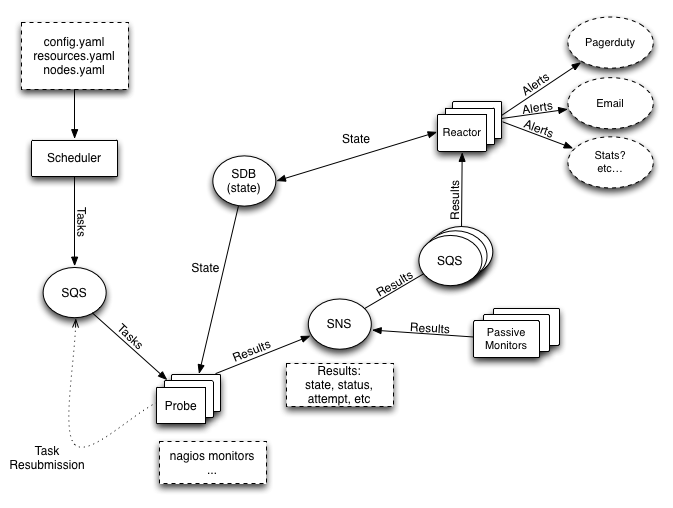 Probes submit results into SNS topics, which then pass them onto the reactors’ SQS queues. This allows a single result to be shared amongst multiple types of reactors, as well as allowing results to be sent to various other endpoints. We use AWS SimpleDB to store state. This state database is written to by reactors when they receive results. It’s read from by probes (to make sure we aren’t beating a dead horse when something is down and has been down for some time) and by the reactors (to allow for logic regarding reacting to results that have changed state, or have been in a state for some length of time). We use AWS Simple Email Service in some reactor handlers in order to be able to easily send email. Each of these services is used fairly lightly in most cases, so the charges should be minimal in almost all cases. The upside is that we currently do not require physical servers for any of these functions, which inevitably cost a significant amount to build and maintain. In the future it should be fairly easy to convert these services to other systems (such as RabbitMQ, MongoDB, etc). Right now all monitors are active monitors - they are fired from the probes and contact other services via various protocols to determine if the service is in an okay state. Because of the design using the various queues however, it should be simple in the future to submit passive results. The reactors are very permissive in accepting data from just about any source just as long as it comes from their queue and it fits the correct dataformat. As well we use a plugin format identical to the Nagios format. The benefit of this is that there is a vast wealth of nagios plugins out there, and they can be used as is with NYMMS. In the future we may come up with other plugin formats, but we haven’t had a reason to so far.